Summary: A trick of propagandists is giving rebuttals to theories held only by a few extremists, and ignoring the far stronger theories held by thoughtful opponents. That gives the illusion of strength while marginalizing opponents. It works only when your side dominate the media. Which neither Left or Right does in America today. Here we see how this works for climate change propaganda. One of the more striking features of the contemporary conservative movement is the extent to which it has been moving toward epistemic closure. Reality is defined by a multimedia array of interconnected and cross promoting conservative blogs, radio programs, magazines, and of course, Fox News. Whatever conflicts with that reality can be dismissed out of hand because it comes from the liberal media, and is therefore ipso facto not to be trusted. … This epistemic closure can be a source of solidarity and energy, but it also renders the conservative media ecosystem fragile. … If disagreement is not in itself evidence of malign intent or moral degeneracy, people start feeling an obligation to engage it sincerely— maybe even when it comes from the New York Times. And there is nothing more potentially fatal to the momentum of an insurgency fueled by anger than a conversation. Sanchez’s description appears true of the Right, IMO. But also true to some degree of the Left as well. In, for example, many of their writings about climate change. As in these two articles. Polls show that many members of the public believe that scientists substantially disagree about human-caused global warming. … I read whatever combination of titles, abstracts, and entire articles was necessary to identify articles that “reject” human-caused global warming. To be classified as rejecting, an article had to clearly and explicitly state that the theory of global warming is false or, as happened in a few cases, that some other process better explains the observed warming. (a) Powell cites no people or articles that “reject human-caused warming”. For good reason, as that would mock his procedure. In fact most of the people writing at the best-known “skeptic” websites (eg, Watts up with that, Climate Audit) frequently and clearly state that they do believe that the world has warmed during the past two centuries, and that our emissions of CO2 have been the major cause during the past 60 years. Skeptics question the magnitude and relative causes of past warming, its effects on other aspects of climate, and future climate trends. All of these things are subjects of active debate in the professional literature. (b) Powell cites no polls showing how many people “reject human-caused warming”. The polls I’ve seen don’t clearly ask that question. For example, consider this March 2012 Gallup poll. The world has been warming during the past two centuries, and in the past century. But the IPCC says — confirmed by ample peer-reviewed research — that only after WWII did anthropogenic CO2 become the largest cause of warming. Are the people answering this question insufficiently educated about the state of climate science — or too well-educated for Powell? For details see: When did we start global warming? See the surprising answer (it’s not what you’ve been told). 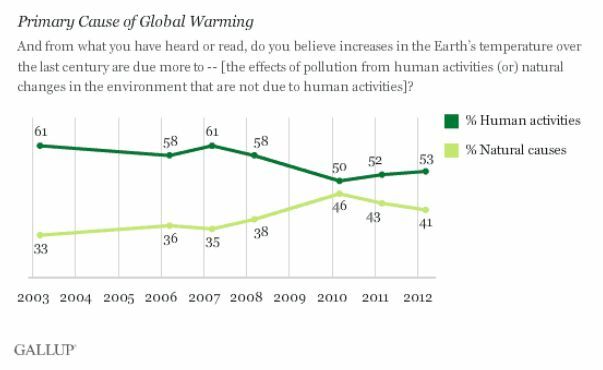 Gallup asks a second, related question: if “global warming is occurring”? But the question does not specify a time horizon. Over what horizon? Thousands of years (ie, since the last ice age)? Yes. Two centuries? Yes. Fifteen years? No. The past year? That’s complex, given the many different was to measure global temperatures of the stratosphere, surface, and ocean. Again we see the illusion of simplicity fail for complex scientific questions. For some details about this see: Still good news: global temperatures remain stable, at least for now., 14 October 2012. Powell and Plait provide little basis for their arrogant rebuttals, which combine strawman attacks and imprecise reasoning. However sloppy, they draw conclusions pleasing to those sharing their Left-ish bubble — and will be endlessly repeated until they become regarded as immune to criticism. This is the same process that so dominates thinking on the Right, and which led them into a deep intellectual hole into which no light reaches. The same dynamic has crippled the “peak oil” commuity, where any outlandish forecast gets respectful applause. This should give Left reason for self-examination, and to criticise articles like these by Powell and Plait. Some criticism of people in their own community might pay large dividends in terms of increased public credibility, even if it means giving up some opportunities for lurid propaganda. Shaping your view of the world with well-constructed propaganda, 21 June 2012 — About rising sea levels. Previous Post Does corruption limit China’s growth, or pose a threat to its existence? We, the People, have raised confirmation bias to an art form. I think the lesson and example of science is that this is a universal cognitive bias, and overcoming it consistently is not possible at the individual level: it requires community/institutional support—e.g., scientific method. My perception is that outside the realm of science, the effectiveness of our social systems for pursuing truth over belief—journalism, universities, etc.—is frighteningly less than it was half a century ago… this despite the Internet, which should be helping, but instead seems to be doing more to reinforce epistemic closure than to undermine it. I hope that is just the nostalgia of an old fogey. If it is not, I suggest that there is nothing more important We the People can do toward a better future than to reverse that trend. For what it’s worth, I’ve always admired this web site in that regard. There are too few places where closing in on what is true takes precedence over sending the right message. I agree 100%. I describe this phenomenon as the breaking of our OODA loop. We can only describe these things through metaphors, but the underlying problem seems real and serious. My guess — emphasis on guess — is that we just don’t care. Debates about these things in the public are largely entertainment. No matter how serious the subject, articles by non-specialists about peak oil, climate change, our war on terror all read to me like fan fiction. The author is engaged, but in the same my as my son playing a new role-playing game. I see this in the discussions by Directors and Officers in the community organizations I work with. They care, but are disengaged. Their role is to provide ideas, applause, and criticism. An audience, not actors on the stage. Most no longer even have the idea of acting as principals in their mental universe. Dealing with the issue of epistemic closure (its origins, evolution and consequences) seems of profound importance when attempting to formulate alternative political visions to the status-quo. The type of passionate knowing increasingly articulated by portions of the left and right( which will probably continue to increase as our societal crisis expands) indicates an accelerating intoxication with certainty. But if such an intoxication is rejected (i.e. not knowing with certainty but still claiming to know) can such a position be the foundation for an alternative politics? Another way of formulating this issue is—in rejecting gnosis in favor of agnosticism is it still possible to formulate a viable political alternative? I believe that it is possible (which is another important discussion) and that possibility centers around the seeming imperative of metaphor in all descriptions of reality—realizing that if one rejects metaphoric thinking then one seems to be approaching the metaphysical foundations of both Nazism and the Gulags. I would appreciate some analysis — or pointers to such — about epistemic closure. I’ve read the wikipedia article about the underlying philosophy behind this, and it’s over my pay grade. It’s simple as Sanchez describes it, and seems to accurately (so far as I can tell) account for crowd dynamics on the left and right. But its origins and possible cures are mysteries to me. The Wikipedia article is about the philosophical term, which is completely unrelated to its recent use in the socio-political context. It’s not even a generalization or adaptation; there is no connection at all between the two concepts. Thanks for the explanation. I saw that the philosphical definition was different than Sanchez use, but assumed that was because I didn’t understand. He does an outstanding job. IMO. Climate science seems a poor example of epistemic closure on the left because climatology is complex, the data is extremely dense and, going back in time to the 1800s and earlier, of dubious quality. The fake panic over frankenfoods. The left is in a hysterical izzy over GMOs, or Genetically Modified Organisms. But guess what? Almost everywhere we eat is a GMO — corn was carefully bred over many thousands of years into its current form, wheat has been extensively modified by humans over thousands of years, rice, soybeans, oranges, potatoes…all cross-bred and selectively cultivated since before the start of the written word, and all massive genetically modified. You don’t hear lefties screaming with rage and panic about eating corn or rice. If scientists do in the lab in a year the exact same thing American farmers have done over two centuries by cross- breeding and transplanting and budding and selectively cultivating, why is that bad? Why is that dangerous? The whole panic over GMOs make no sense, either scientifically or socially. Even more absurd, some of the most beloved of the average person’s companions are GMOs: dogs and cats. Feral dogs are vicious and genetically differ greatly from domesticated dogs, ditto cats. But somehow we don’t hear liberals shrieking about banning dogs and cats. The bizarre and baseless fear of nuclear power. For 40 years, France has been running a nuclear power program that now provides 80% of their electricity. They’ve never had an nuclear accident. Likewise, America’s nuclear sub program has never had a single accident or problem in 50 years. These examples show that nuclear power isn’t inherently dangerous, it just need to be organized and operated properly. Moreover, the panic about radiation release is unscientific. More radiation gets released by the radon gas in the basements of old houses than has ever been released from all the nuclear accidents put together, excepting Chernobyl. This pie chart from the EPA showing source of ionizing radiation exposure (only 18% from man-made sources, the rest from sources like isotopic cesium in your bones, radon in your basement, cosmic rays during a high-altitude jet airliner flight, etc.) proves eye-opening. The phony panic over “artificial additives” in foods. The same liberals who panic over polysorbate 60 (a harmless emulsifier) added to foods eagerly buy and smoke back-door marijuana filled in who-knows-what toxic additives and completely unregulated by the FDA. It’s to laugh. The rage over “money in politics.” Barack Obama raised around a billion dollars in the recent presidential campaign. Somehow money in politics becomes good if it flows to the Sierra Club or Obama or Save the Whales. Money in politics is only bad when it flows to the NRA or Mitt Romney. Somehow I don’t hear liberals agitating in the streets to stop the flow of cash into Obama’s campaign coffers or into the treasury of the Sierra Club. Why is that? You err: the organisms we have been eating for so long have been genetically _selected_ (i.e. bred, crossed, and chosen — artificial selection instead of natural selection), not _fabricated_ (i.e. splicing genes from unrelated organisms into each other). This is a fundamental difference. By the way: there is a new “school” of genetic engineering that recognizes that (a) traditional breeding has been surprisingly more successful than mainstream GMO approaches at elaborating interesting organisms (e.g. resistant to diseases, drought, endowed with more vitamins, etc — there are many examples of this); (b) that traditional breeding is very slow (it can take decades); (c) that it is more acceptable to the public and probably less risky anyway to deal with organisms in the same family. Conclusion: they are now adapting genetic engineering to mimic what is happening with traditional breeding — but with the goal of speeding up the process by an order of magnitude or so. You err: of course they have. There is an international scale, ranging from 0 to 7. From 4 upwards, you are officially in the accident zone. Chernobyl and Fukushima are level 7, Three-Mile-Island level 5. In France, there were two accidents of level 4 in the same nuclear power plant — one in 1969 involving a partial core meltdown (yep! ), and in 1980 an overheating the graphite. Each year the official nuclear safety authority in France records hundred of incidents below level 4 — and it has been duly criticized for classifying such events as uncontrolled spills of radioactive material abandoned without supervision for decades at level 1 (i.e. “minor incident”). Oh, about “America’s nuclear sub program has never had a single accident or problem in 50 years.” Isn’t everything duly classified and kept under wraps because of “state security”? Perhaps one of the issues with the propaganda surrounding climate science, derives from the mere fact that many of the people who report on the science are not able to comprehend the scope of the science that is involved in producing the theories that the scientists producing them have a firm grasp of. In science there is only theory in the beginning and over the course of time it is made fact, but only when you can no longer argue against it, i.e. the sun sits at the center of our solar system. 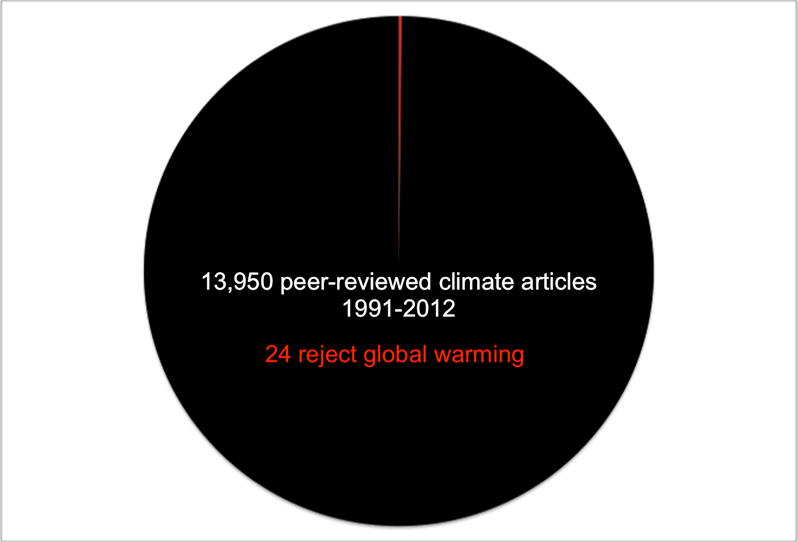 Climate science is still in the arguing stage of producing facts. It is a common issue among the “laity” to enter into a line of thinking where, “if they don’t know it all, they know nothing”. This leaves the door wide open for extremists to come in and either lay the seeds of doubt, or doomsday when concerning a science that is fairly new and still developing and learning. I think it can be said that the fact of science is this, those who pursue PhD’s in climate science are working with more wattage then the common man trying to understand their theories. It is the difference between lighting your house with 40 watt bulbs vs. 100. When you get into the more complex sciences, much of what is spoken among the scientists is done so in mathematical terms. It is then left to them to find ways of using common language, that was developed as a means to communicate perceptual information, to describe things in their findings that do not lie with in the realm of perceptual information; hence the use of math. It is at this point things can become misconstrued by those who cannot begin to understand the process by which these theories were arrived at. We in this country are faced with a great challenge when it comes to convincing the masses of new scientific ideas or theories. We have a large percent of our population who believe the world is 6000 years old, was created in 7 days and life itself is the result of an intricate combination of dirt and divine breath?. When the arguments over climate stop, new discoveries will be made, producing new scientific ideas and theories. And there will be new left and right ignorance, paving the way for the masses to follow. What can you do? A saying I love “you just can’t fix stupid” and maybe that can be laid down in the catalogue of facts as well?. Here is a site put on by scientists about this very issue. The topics are informative and many of the comments…..well involved. IMO, if you can’t keep up with the arguments on this site; probably best to leave this issue with those who can. Thanks for the link to that site. I’ve been looking for one just like it for a while now. Sorry, no. In both cases we’re talking about genetic modification. It’s not a fundamental difference. Moreover, it is now well known that jumping genes (transposons) spontaneously create genetic modifications within organisms, and that viruses are constantly inserting new genetic material into the DNA of higher organisms, including humans. “About eight percent of human genetic material comes from a virus and not from our ancestors, according to researchers in Japan and the U.S.” Source: “Repeated horizontal transfer of a DNA transposon in mammals and other tetrapods,” John K. Pace II, Clément Gilbert, Marlena S. Clark, and Cédric Feschotte, 7 July 2008, Proceedings of the National Academy of the Sciences. So if your claim is that GMO organisms are somehow fundamentally different from hybrids created by farmers because GMOs involve tranposing DNA sequences from completely unrelated organisms, sorry, you’re completely wrong since that already happens in nature. Of course you’re free to write Feschotte et al. and inform them of their error. Doubtless they’ll be happy to retrace their research paper. Youa re correct that France has had some nuclear accidents. What it hasn’t had is any serious accidents that presented any danger to anyone. Their nuclear reactors appear well designed and their nuclear power program well run. Given the alternatives, it makes a lot more sense to move to a well run nuclear fission nationwide power grid than to try to make bogus fantasies like wind power or solar power (storage in what kind of batteries? How? It’s impractical and far beyond existing battery technology) work when every expert who has studied this issue points out that solar and wind power are simply not capable of scaling up to the levels needed, and the battery technology simply isn’t there, and is not likely every to be there given our current knowledge of physics & chemistry. We would need batteries five times as energy dense at one third the current cost to make wind and solar power practical. There’s no sign of that on the horizon, and certainly there hasn’t been anything like that kind of progress over the last century of battery research. But perhaps you can give us a workable practical alternative to nuclear power. We’re all ears. Obviously I know about the incorporation of alien genetic material (typically viruses) into animal and plant species — including our own. I also know that different genes interact in complex ways, that disturbing their order (e.g. by inserting new genes) can have effects on their expression, and that (not well-understood) epigenetic effects can alter radically how they are expressed. Thousands, if not millions of years have passed to weed out the most deleterious of those natural alterations. How long do GMO engineers take to check whether the organisms they concoct are innocuous when fed to higher organisms? 3 months. On rats. And you want me to assume that a lifelong ingestion of GMO is safe? Besides, stating that natural and artificial selection, and genetic engineering are the same because they are “modifications” is willfully ignoring the differences in how they operate. After all, why not submit fruits to careful isotopic treatment — it has been shown to produce extra-large fruits! Mutations? they occur all the time in nature! It’s just genetic modification! In fact, I remember reading as a child about these wonders of the atom in the illustrated books on science and technology for children — decades ago. Guess something about that form of genetic modification must have proven unsatisfactory that it is no longer considered. And once again, I repeat: genetic engineering is evolving. Leaving aside the fact that pest resistance in GMO fields has been increasing dramatically, the current approach (direct splicing of interesting genes from one organism into another) works if you have exactly one gene with limited expression (e.g. BT into potato or cotton). It has proven disappointing for complex — and really interesting — properties like drought resistance, or nutritiousness, or tastiness. Too many gene interactions. Too many epigenetic factors. That is why research is slowly shifting away from directed insertion of genes towards replicating what breeders have been doing (take sets of genes from those fruit sorts, mix them according to design-of-experiments standards, produce a large variety of possible crossings, grow them in the field, test the results) — except faster. You very obviously have been following neither how the La Hague processing plant has been run, nor how the current, new generation EPR construction is being run. In the short to medium term, the only practical and cost-effective way to address energy requirements is through energy efficiency (relative aspect) and energy savings (absolute aspects). Easy? No — but history has demonstrated that nuclear fission is far too dangerous and expensive to afford. The last generation of French nuclear power reactor is very expensive, the few build examples are in the range of 5000 EUR per kW, the Italians and Brits have no longer interest in this design. Figure why. A good on-shore wind turbine produces at relatively good sites cheaper than nuclear. If you add some legal and financial issues – here construction time is very important – wind becomes much more interesting than nuclear. Nonsense, you have first to get a feeling for the number of independent production sites for wind, this dramatically flattens the production curve and avoids storage. Even in small Germany you can overbuild power by 30% without loosing any energy. Therefore, it is according to studies (by industry (!)) useles to think about storage as long as renewables have a share less than 40% of . In the USA you have better conditions, so the 40% reneables esp. wind are doable. Then you think about pump storage, then about battteries. At the end of 2012 we have in Germany around 25% gross electricity production (~30% net electricity production) from reneables, the net stability has increased and is much much higher than in countries with very low share of reneables. The two larger incidents (February in Lower Saxony, a few weeks ago in Munich) were not caused by reneables. I have in principle nothing against nuclear and think the shut down of 8 reactors in Germany last year was not very intelligent (we have burnt around 20 billion EUR), however, I can clearly see that alternatives work and think you shoud bring your technical knowledge up to date. There is really good stuff published by Fraunhofer Institutes. There was a book written in the late 1990s “Seeing Like a State: How Certain Schemes to Improve the Human Condition Have Failed” by James C. Scott (Yale University Press) which seems to begin to get at a portion of the issues in epistemic closure. In his analysis Scott draws a distinction between what he calls practical knowledge (the form of knowledge embedded in local experience (the Greek word for such knowledge is metix) and what he calls technical knowledge usually expressed in the form of hard and fast rule, principles and propositions (also known as episteme or techne in Greek). In techne there is usually a self-contained system of reasoning in which the findings are logically derived from initial assumptions and this knowledge tends to be impersonal, quantitatively precise and completely impervious to context ( for example, the Pythagorean theorem being true for right triangles everywhere and forever). In metix (or local knowledge) the situations tend to be more transient, shifting, disconcerting and ambiguous and usually do not lend themselves to precise measurement. An example Scott gives of local knowledge is the advice Indian tribes supposedly gave to the early European settles in North America about how to cultivate maize (ire. to plant corn when the oak leaves were the size of squirrel’s ear). In his book Scott basically argues for the creation of Metis-friendly institutions. He also argues that epistemic knowledge often tends to have universalistic claims which seem inherent in the way in which such rationalist knowledge is pursued. Scott concludes that there is often no door in the epistemic edifice through which local knowledge can enter on its own terms and it is this imperialism of epistemic claims which must be thwarted. Thank you for this comment. Those like your, by people with a deep understanding of the topic, make a large contribution here and are greatly appreciated! Correct, and the earth sits at the center of earthly system. In the first case orbits (of planets) would be described as ellipses in the second case they would be described as cycloids. The first model is more convenient for mathematical calculation that’s why scientist picked it. Scientists (precisely speaking) don’t study nature. Scientists build models of different aspects nature and then they study their own models. But I have no problem with these dogmas like many other religious scientists don’t have problems with them. I have problem when ideologists using science to challenge my religious dogmas as if their dogmas cooler then mine. As for global warming – I have no problem with the current scientific model. At the end of a day scientific model explains state of mind of the scientists, not nature. Scientists need their models for their things. Tomorrow will be another model. Wow. That’s a perfect illustration of a certain kind of thinking. I hope nobody ruins the demo by poking at it. Let it stand just as it is. There really isn’t anything more to be usefully said in reply, IMO. But, of course, this is Freedom Hall. If you’d like to, post away! This is to good to ask for comments’ relevance to the underling post! It’s more complicated than that Faby. Unfortunately he’s half right! In fact the earth is at the center of the OBSERVABLE universe. And I also agree with your point about modeling. In the software business we are told not to try and model all of reality. It’s too expensive. A model is only a *useful* approximation of reality. And as the observations change the model should change. All that being said, this notion that the decay rate of unstable nuclei can change over time is pretty dumb. If that were true then it would be impossible to predict the outcomes of nuclear reactions. Which it isn’t. It all goes back to humanity’s primitive tribal behavior. I don’t believe that most right wingers are anti science or that liberals are for people walking around naked in San Fran. And yet the silence is deafening. I wish we could move beyond that kind of thinking in America. Reading this is fascinatingly like a Psychological Thriller….reminds me of many and oddly “A Clockwork Orange” came to mind. One wonders if in your previous life you openly encouraged some subordinates to consider the act of possibly burning the heretics. I’m talking about period of thousands of years (or millions of years in scientific way of calculation). And generally specking – statement that all laws of nature that we study now were exactly the same 100 million years ago is also scientific assumption. And let me emphasize one more time – I have no problem with assumptions like that. I have problem when some commi claiming on his website that he knows ultimate truth, that they scientists PROVED that God doesn’t exists and that he discovered formula of happiness for society and the only reason that hold us from that is that we don’t grant enough authority to our rulers to force it upon us. That natural laws are constant over time is a primary assumption of all sciences, physical and social. Announcing that tells us nothing of use. It’s up there with god is dog backwards. You have framed the terms of debate as ‘Left vs. Right’ and as ‘Science vs. Superstition’ in a wonderful demonstration of Strawman Argumentation yourself. At least the gloves are off and you have shown this a purely political exercise in punditry. Pity. There should be no need to show that it is impossible to prove one has correctly predicted the future….because one cannot. Please explain. You comment makes no sense to me, perhaps because it has too little detail. (a) Where did I frame this as “science vs superstition”? The world is warming; no superstition involved. (b) What “strawman arguement” did I make? What does this have to do with this post? I looks irrelevant to anything said in the post. I am feeling as though the comments on this thread have fallen dramatically off topic. And for this I must…. Just last week an interdimensional portal opened in my back yard, and from it came forth glorious, glistening, gargantuan gods who told me that after living three days in the belly of a whale I would be vomited up onto the shores of the nether realm where secrets of all that was, is, or will be would be telepathically transported into the depths of my mind. I just got back yesterday. If anyone is curious as to what the next few decades hold, all that is required of you is this…..Build me a lavish church, where a shabby basket is passed around once a week to pad my own pockets….and then I shall let you in. Someone please try to challenge my claim, and don’t try using all that made up science nonsense. We all know it is nothing more then a conspiracy to over throw capitalism! How strange that such a thing happened to you, too. Last night the Monkey Gods visited me, bestowing their scrolls of Ultimate Truth. I will share their Secrets with you, once I decode their strange and beautiful script. Now we get some very good humor on the old FM Place. I bet Giorgio Tsoukalos would also be interested in this amazing revelation. Their next season starts 12-21-12 and if you could get those translated stat, it may lend new information for their upcoming programs. I however, don’t need the info. But I do have a question? Why didn’t you have to endure the whales belly? I am feeling rather put upon. if you like this type of humor here is a site I was recently made aware of that you might like. Though humor has a wonderful way of lightening the mood in most any circumstance, my comment before last did have another purpose. Without a way to ground humanities rather whimsical and often times radical imagination, what is to stop those who would play on our need to have a belief in something beyond that which is perceived by our 5 biological senses? In this way science protects our faith as much as it urges us to look beyond it. One must only possess the ability to divide their understanding into two separate hemispheres. One that reasons, and one that dreams of the unknown. IIRC most polls show that there is some overlap between people who believe in creation and people that believe in the big bang, to put it crudely. Can’t find any links for this though; maybe it’s just wishful thinking. Enough people paying attention. The same goes for those who worship nothing but power, unafraid of any ultimate consequences. Wonderful that guest and ulenspiegel1965 have inadvertently provided superb supporting evidence for my contention that the left is equally guilty of mindless epistemic closure and lockstep hermetically sealed groupthink as the right. Guest is spouting unbelievable tripe straight out of the 1930s. it cannot have escaped the attention of anyone reading this forum that guest’s failed and foolish “Man was not mean to meddle with nature!” argument is the exact same ridiculous canard used to demonize every scientific advance since the beginning of history. The wheel is evil, because nature spent billions of years evolve man’s legs to walk on! The phonograph is an atrocity because nature evolved our ears to deal with sounds of reasonable loudness and not these horrible cacophonous blasting artificially amplified noises! Vaccines will destroy our species because nature refines us by culling out our sick and preventing them from reproducing and passing on their genetic susceptibility to diseases! The unspeakable stupidity of guest’s argument requires no comment, but extra attention should be paid to the hidden folly that inspires his ridiculous and nonsensical claims: There are some things man was not meant to know This canard is based on the cherished left-wing delusion that nature is good (with a capital G) and man is flawed (with a capital F). The origin of this foolish canard is equally obvious: it comes from the Bible, from the doctrine of original sin. Adam and Eve existed in bliss in the state of nature. Their Fall resulted from the introduction of knowledge (the serpent introducing the apple). The trouble with his failed and foolish worship of nature as always good by left-wingers is that it rests on a complete misconception of both nature and evolution. That which is natural kills and infects us as well as helps us. Cancer is natural. Hookworms are natural. Parasites like the botfly are natural. The candiru is natural. Mindlessly worshiping Nature as good is an old leftie obsession that dates back to Rousseau, and it’s pure folly. To see the full ignorance and folly of guest’s claims, take a look at the history of human-modified crops and animals and see how many problems they’ve created. Guest claims that the hybrids that humans have spent hundreds of years refining are “completely different” from and much safer than the new genetically modified organisms created by gene splicing in the lab, but that’s utter nonsense and the facts prove it. All bananas are clones and just a few years back, all bananas in tthe world became susceptible to a particular form of blight and the banana nearly died out. This is the “wisdom” which guest praises. Many other examples abound: race horses are so highly bred for speed that they suffer from many genetic defects such as excessively fragile bones, and a disproportionate number of racehorses must be put down before they reach maturity because of these purposely inbred defects. Once again, no sign of marvel forethought from the alleged hundreds of years of careful breeding. Agriculture in the developed world produces monocultures of crops highly susceptible to blights and rusts, putting them at greatly increased risk as compared to wild varietals. Once again, no sign of superior wisdom in all that breeding. So there’s no evidence that spending hundreds or thousands of years breeding hybrids produces plants or animals more resilient than genetic transplants generated after a few years of experimentation in the lab. But the same is true from the other direction. Nature, contrary to leftie fantasies idolizing Rousseau, is not some infinitely wise Mother Goddess. Nature operates by blind random chance, evolution is a lottery, and Dollo’s Law tells us that nature operates as a crude cruft kludge, blidngly modifying existing organisms in grossly inefficient ways. In fact, evolutionary biologists now know that Nature operates by evolving organisms in the least efficient and least useful way compatible with their survival. This is why the giraffe has a ridiculously long 15-foot-long vagus nerve. It’s why humans have a largely useless appendix. There are so many examples of crappy kludgy design in evolution that it’s clear guest’s foolishly ignorant assumption of Nature as an omnipotent omniscient all-wise Master Clockmaker is a deluded fantasy that was debunked even back in the 18th century, when it first appeared. Barely used nerves and muscles, such as the plantaris muscle of the foot, that are missing in part of the human population and are routinely harvested as spare parts if needed during operations. Another example is the muscles that move the ears, which some people can learn to control to a degree, but serve no purpose in any case. The common malformation of the human spinal column, leading to scoliosis, sciatica and congenital misalignment of the vertebrae. Almost all animals and plants synthesize their own vitamin C, but humans cannot because the gene for this enzyme is defective (Pseudogene ΨGULO). Lack of vitamin C results in scurvy and eventually death. The gene is also non-functional in other primates and in guinea pigs, but is functional in most other animals. In the African locust, nerve cells start in the abdomen but connect to the wing. This leads to unnecessary use of materials. Intricate reproductive devices in orchids, apparently constructed from components commonly having different functions in other flowers. The use by pandas of their enlarged radial sesamoid bones in a manner similar to how other creatures use thumbs. The existence of unnecessary wings in flightless birds, e.g. ostriches. The route of the recurrent laryngeal nerve is such that it travels from the brain to the larynx by looping around the aortic arch. This same configuration holds true for many animals; in the case of the giraffe, this results in about twenty feet of extra nerve. The prevalence of congenital diseases and genetic disorders such as Huntington’s Disease. Crowded teeth and poor sinus drainage, as human faces are significantly flatter than those of other primates and humans share the same tooth set. This results in a number of problems, most notably with wisdom teeth. The existence of the pharynx, a passage used for both ingestion and respiration, with the consequent drastic increase in the risk of choking. The structure of humans’ eyes (as well as those of all mammals). The retina is ‘inside out’. The nerves and blood vessels lie on the surface of the retina instead of behind it as is the case in many invertebrate species. This arrangement forces a number of complex adaptations and gives mammals a blind spot. (See Evolution of the eye). Six muscles move the eye when three would suffice. The loss of tetrachromatic vision by mammals as compared to other tetrapods. The enzyme RuBisCO has been described as a “notoriously inefficient” enzyme, as it is inhibited by oxygen, has a very slow turnover and is not saturated at current levels of carbon dioxide in the atmosphere. The enzyme is inhibited as it unable to distinguish between carbon dioxide and molecular oxygen, with oxygen acting as an competitive enzyme inhibitor. However, RuBisCO remains the key enzyme in carbon fixation, and plants overcome its poor activity by having massive amounts of it inside their cells, making it the most abundant protein on Earth. The enzyme nitrogenase actually preferentially binds with acetylene over di-nitrogen, despite its being the key enzyme used in nitrogen fixation in many bacteria and archaea. The breathing reflex is stimulated not directly by the absence of oxygen but rather indirectly by the presence of carbon dioxide. A result is that, at high altitudes, oxygen deprivation can occur in unadapted individuals who do not consciously increase their breathing rate. Oxygenless asphyxiation in a pure-nitrogen atmosphere has been proposed as a humane method of execution that exploits this oversight. Sturdy but heavy bones, suited for non-flight, occurring in animals like bats. Or, on the converse: unstable, light, hollow bones, suited for flight, occurring in birds like penguins and ostriches, which cannot fly. Various vestigial body parts, like the femur and pelvis in whales (evolution says the ancestor of whales lived on land) or the third molar – or ‘wisdom teeth’ – in humans (whereas some other primates with differing jaw shapes make use of the third molar). Turritopsis nutricula and Hydra genus have biological immortality, but most animals do not. Many species have strong instincts to behave in response to a certain stimulus. Natural selection can leave animals behaving in detrimental ways when they encounter supernormal stimuli – like a moth flying into a flame. Plants are green and not black, even though black plants would absorb more light energy. I would like to thank guest for fulsomely demonstrating FM’s thesis: namely, that propaganda in American society has completely deformed the thinking of both the left and the right. Since we see epistemic closure on the left among liberals just as much as on the right among conservatives, it’s easy to predict that guest will continue to spout nonsense in frantic defense of his indefensible cancards and liberal fairytales about Nature as a purported all-wise all-caring earth goddess with which we interfere (via gene-splicing) at our mortal peril. Since the exact same failed and foolish arguments were made about previous scientific advances like modern surgery, modern dentistry, vaccines and antibiotics, it’s unnecessary to debunk guest’s utter nonsense aside from noting that it proves with superb effectiveness FM’s claim that propaganda has brainwashed just as many liberals on the left in America as conservatives on the right. Has Thomas Moore ever considered creating a blog which seeks to undermine irrational thinking? You have made several great points in your comment that would be interesting to read in more detail. When would you say this fear of altering nature began and why? Do you think the inconstancies in natural design might be due to our ever changing climate, and there for ever changing species? (This applied to all species not just our own) And is there any good reading material on this subject specifically?